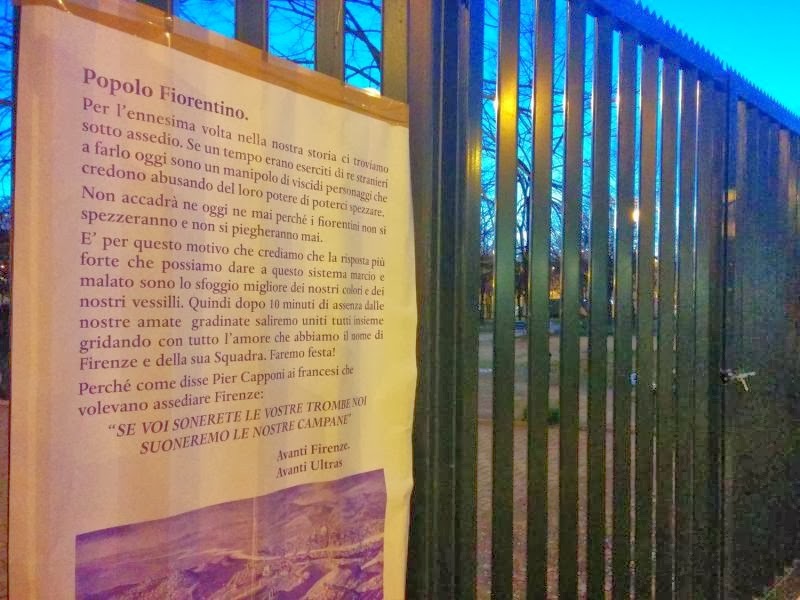 The Florentine football team got well and truly shafted. For the umpteenth time. In Parma. On 24 February. 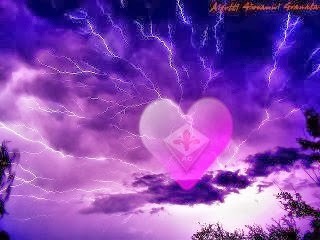 Fiorentina, a.k.a. 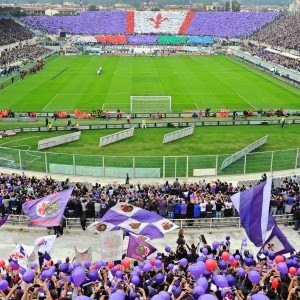 La Viola = The Purple, is a major club from a merely medium-sized city. 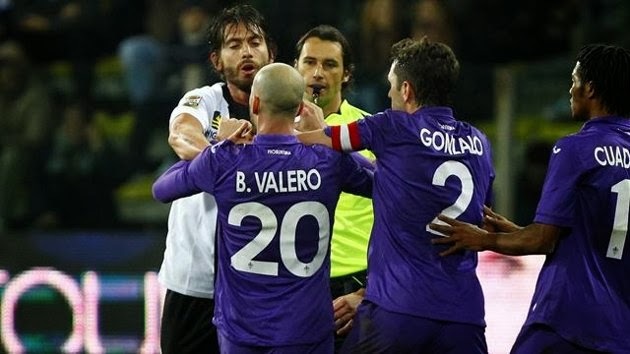 And time and again - whenever La Viola comes near to winning anything that matters - the FIGC (Federazione Italiana Giuoco Calcio, the national governing body) sends in crooked referees to nip that in the bud. The crooked referees - this time - were Stefano Braschi and Andrea Gervasoni. And the result in Parma was a fabricated 2-2 tie, with a four-game suspension for Florence's admired mid-fielder Borja Valero. We find ourselves under siege, for yet another time in our history. In the past, we were invaded by the armies of foreign kings. Today, there is a gang of slimy characters who think they can divide and conquer us through the gross abuse of their power. That will not happen - today or ever. We will never be divided nor will we bend our knee. Our best response is to unfurl our flags and show our colors - in the face of a sick and rotten system. Therefore, we will leave the stands of our beloved stadium empty for the first ten minutes of the game. 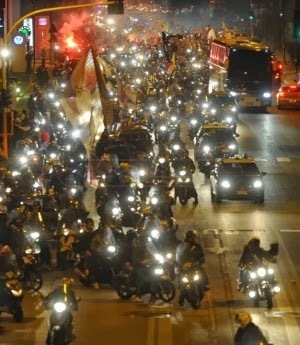 Then we will all march in together, shouting our love for the name of Florence and our Team. Let's celebrate! WE WILL RING OUR BELLS. 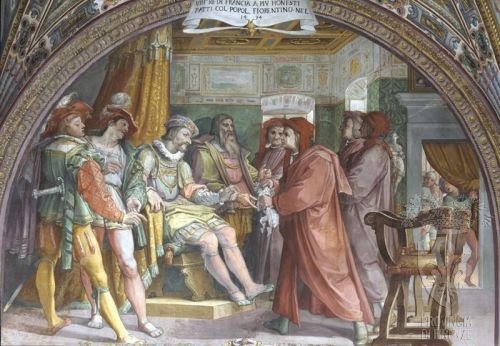 Piero Capponi stood up to foreign oppression (personified by Charles VIII of France) in 1494. The deep purple image on today's proclamation shows Emperor Charles V's siege in 1529-30. But fire and sword, starvation and plague, were all enemies that people could see and face. 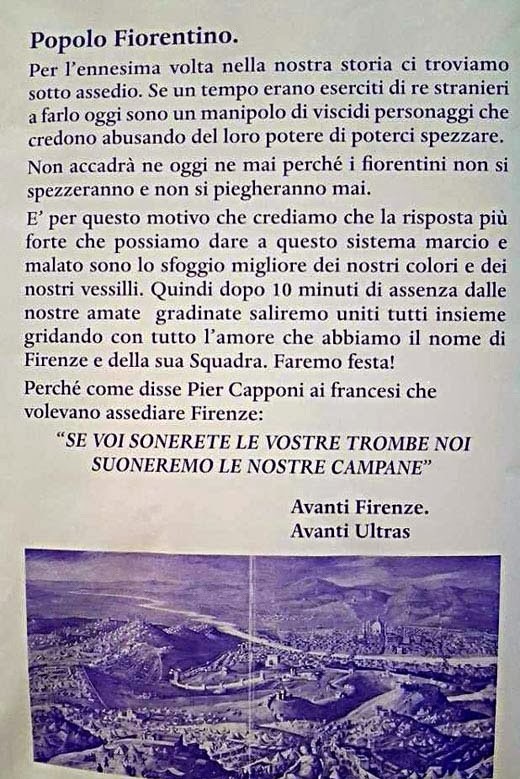 Has Florentine pride - and Florentine exceptionalism - finally met its match in the insidious rot of Calcio all'Italiana? Truth, Justice and the Florentine Way triumphed (in the abstract). Unfortunately, the team played a really sucky game and lost to Lazio, 0 - 1.